You’ll see from our website of which type we’re more fond but this is an important debate in the poultry keeping world so we’re going to discuss the pros and cons of each material. Fantastic plastic or wonderful wood – the debate between poultry keepers continues on a yearly basis and there are strong supporters on both sides. Remember, which ever style of house you choose it’s important to make sure you buy a good quality house that gives your chickens the space, comfort, and security that they need to stay happy and healthy. Wooden houses are obviously more traditional and some poultry keepers would say prettier too. A high quality wooden chicken house will robust, practical, and less likely to blow away in a storm than a plastic coop. One of the most common complaints about plastic chicken houses is that they aren’t breathable and reports of condensation are frequent. You won’t get this problem with a wooden design as wood is naturally breathable. If you have specific needs you’ll also find that a wooden house is more flexible as they can be built to order. In fact, our own bespoke order service is very popular with our customers! Customisation in terms of colour is also easier when you have a wooden house. You can paint them any colour you like and if you change your mind you can sand the paint off and start again, or simply paint over the original colour. 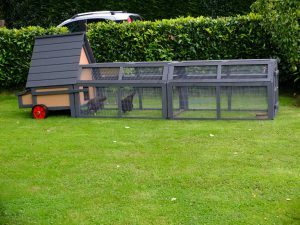 In recent years plastic houses have become increasingly popular, especially with urban chicken keepers and school or college poultry projects. The bright colours make them popular with children and removable lids make it quick and simple to collect your delicious eggs. They’re also easy to clean, give a contemporary look to your outdoor space, and can be cheaper to buy and maintain than their wooden counterparts. Plastic coop fans often tell you that the biggest plus point of having a plastic chicken house is that the risk of pesky red mite is removed. However, if you think that a plastic hen house will make your flock red mite proof, unfortunately you’re wrong. Red mite can not only live on the bird but it can also live in the cracks of the house, hiding from prying human eyes. Lurking in the cracks allows the red mite to sneak out at night and feast on your flocks’ blood whilst they sleep so the truth of the matter is that a plastic house isn’t always a red mite free house. Plastic or wooden? 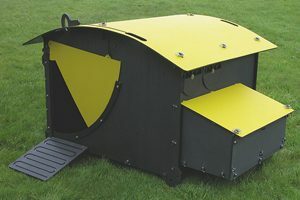 We’d love to hear your opinion on which material you prefer for your chicken houses.